The start of a new year is the perfect opportunity to address those areas of your life you’ve been meaning to work on, but can never find the time to do it. For jobseekers and professionals in general, improving their LinkedIn profile is often one of these things. It isn’t the most difficult of tasks, yet is so easy to put behind your other priorities in life. Meanwhile, every moment your profile isn’t the best it can be is a moment wasted, since you are not able to fully utilize what LinkedIn has to offer. 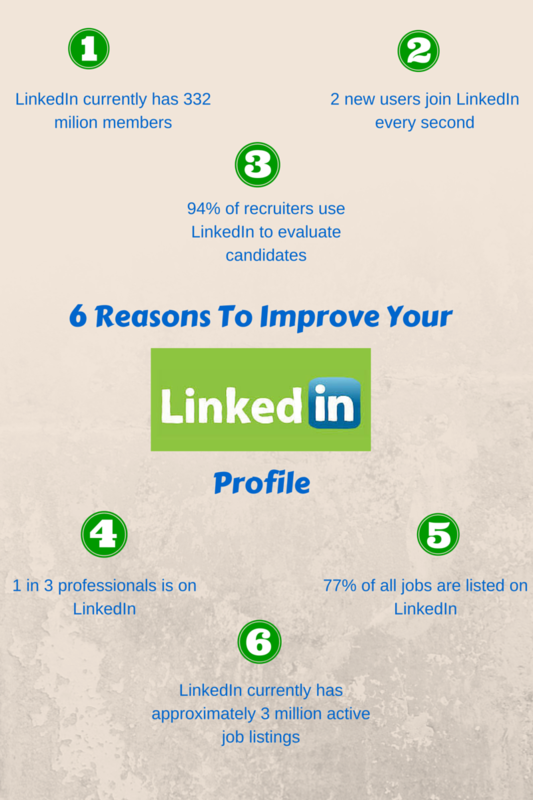 LinkedIn is a valuable networking tool for jobseekers, according to the numbers in our infographic below, so it makes sense to do your skills and experience justice on your profile. If you don’t already have a photo, this is an essential step to take in improving your LinkedIn profile. Not only does it allow professionals to recognize you that may not know you by name, it’s also the first thing people notice when they look at your profile, including recruiters and employers. Make sure that you not only have a photo, but that the photo you have is current, and in it you look professional and content. In the experience section of your LinkedIn profile, make sure you not only include past job titles you have held, but also descriptions of what the job entailed, using powerful and vivid action verbs to describe your responsibilities. Also, chances are your responsibilities have changed or expanded in your current role, so add those in to improve your description of the job you are doing now. Make sure the job titles you are using accurately describe the responsibilities behind them. You may have completely sidestepped the LinkedIn groups section, or if you have joined groups in the past, it is quite possible that some of them are irrelevant to you now. This is one of the quickest and easiest ways to improve your LinkedIn profile and make it appear cleaner. Instead of joining as many groups as possible, try to stick to a couple that really resonate with you, in relation to your skills, interests and job titles. Ask a previous or current supervisor or coworker to write you a recommendation that you can have on your LinkedIn profile. That way, recruiters looking at you will already know there are people out there that think you are talented and hardworking, before they even ask for references. Improve the quality and substance of your profile by adding any other volunteer work you have done, professional organizations you are involved in, classes you have taken and honors or awards you have received. Also include any relevant multimedia content or published work to show off your skills. This entry was posted in Career, Job Search, networking and tagged career, job search, jobseekers, networking on December 17, 2015 by Jessica Cody. Thanks for finally writing about >Start off 2016 With a Bang! Improve Your LinkedIn Profile <Loved it!